PLH3D-6W-XF Universal Kit for CNC / 3DP machines includes all needed parts to connect your laser head to a machine. Includes Magnetic LaserDock and 43 mm Nozzle. Accepts all types of signals: Analog 0-5 V, Analog 0-10 V, PWM/TTL 0-5 V, 0-10 V and 0-24 V.
Allows connecting to any type of the CNC controller output connector and any type of signal modulation. Everything you need is included! Available quantity: 11 Item Items Last items in stock! Use only one input during the connection! Universal adapter allows connecting all types of signals used in CNC machines. All input wires are labeled for ease of use. 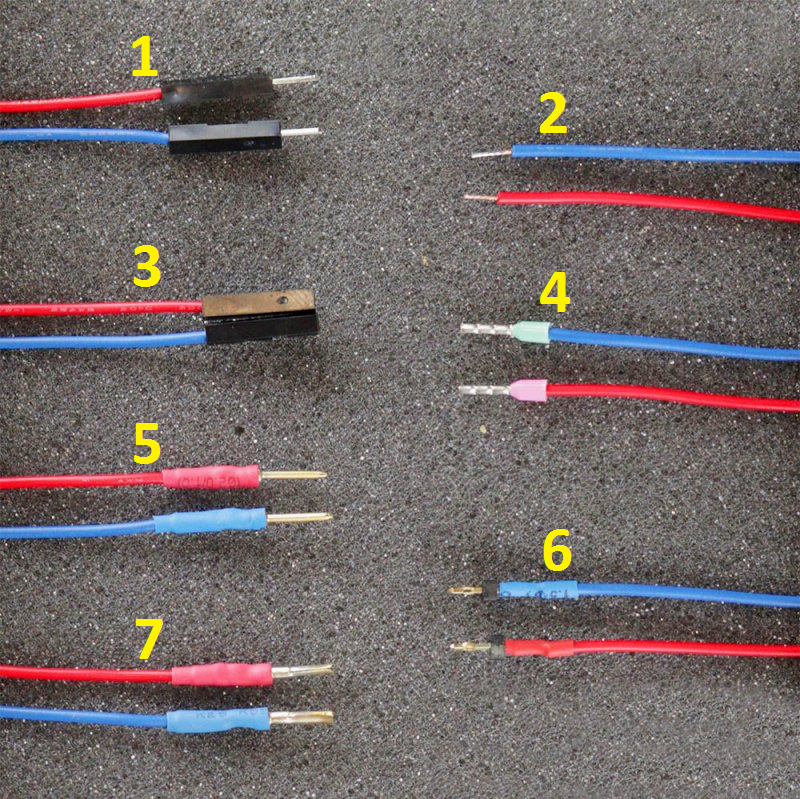 Description of connectivity wires for different physical connectors available in your CNC machines. Simply choose the one which fits your machine! 1. Male gold pin header connector - allows connecting to a gold pin female connector. One needs to find two slots responsible for modulation signal. Analog output 0-5 V or Analog output 0-10 V or TTL/PWM output, and GND. Simply plug the blue wire to the GND and red wire to the signal which is used by the machine to operate the laser. Use the terminal block electric strip to connect the blue and red wire with labeled wires of the Universal Adapter. 2. Tinned copper wires - allows connecting to SMD or THT of the CNC controller. One needs to find two vias/holes or parts on the PCB responsible for modulation signal. Analog output 0-5 V or Analog output 0-10 V or TTL/PWM output, and GND. Simply solder the wires to the part of the PCB board of the controller, the blue wire to the GND signal and red wire to the signal which is used by the machine to operate the laser. Use the terminal block electric strip to connect the blue and red wire with labeled wires of the Universal Adapter. 3. Female gold pin header connector - allows connecting to a gold pin male connector. One needs to find two pins responsible for modulation signal. Analog output 0-5 V or Analog output 0-10 V or TTL/PWM output, and GND. Simply plug the blue wire to the GND and red wire to the signal which is used by the machine to operate the laser. Use the terminal block electric strip to connect the blue and red wire with labeled wires of the Universal Adapter. 4. Insulated wire end sleeves - allows connecting to terminal blocks and screw connectors. One needs to find two terminals of a connector responsible for modulation signal. Analog output 0-5 V or Analog output 0-10 V or TTL/PWM output, and GND. Simply insert the blue wire to the GND terminal and red wire to the modulation signal terminal which is used by the machine to operate the laser and tighten the screws. Use the terminal block electric strip to connect the blue and red wire with labeled wires of the Universal Adapter. 5. Male D-SUB connector - allows connecting to any kind of a female D-SUB connector. One needs to find two slots responsible for modulation signal. Analog output 0-5V or Analog output 0-10 V or TTL/PWM output, and GND. Simply plug the blue wire to the GND and red wire to the signal which is used by the machine to operate the laser. Use the terminal block electric strip to connect the blue and red wire with labeled wires of the Universal Adapter. 6. Press fit male gold pin header connector - allows connecting to a gold pin male connector. One needs to find two vias/holes in the PCB responsible for modulation signal. Analog output 0-5 V or Analog output 0-10 V or TTL/PWM output, and GND. Simply press the connector into the via/hole in the PCB board of the controller, the blue wire to the GND and red wire to the signal which is used by the machine to operate the laser. Use the terminal block electric strip to connect the blue and red wire with labeled wires of the Universal Adapter. 7. Female D-SUB connector - allows connecting to any kind of a male D-SUB connector it can also be used to connect to other types of connectors which are using male pins. One needs to find two pins responsible for modulation signal. Analog output 0-5 V or Analog output 0-10 V or TTL/PWM output, and GND. Simply plug the blue wire to the GND and red wire to the signal which is used by the machine to operate the laser. Use the terminal block electric strip to connect the blue and red wire with labeled wires of the Universal Adapter.